So you know how I like resist techniques right? I have been doing a few in different videos on my channel and I have another one for you today. 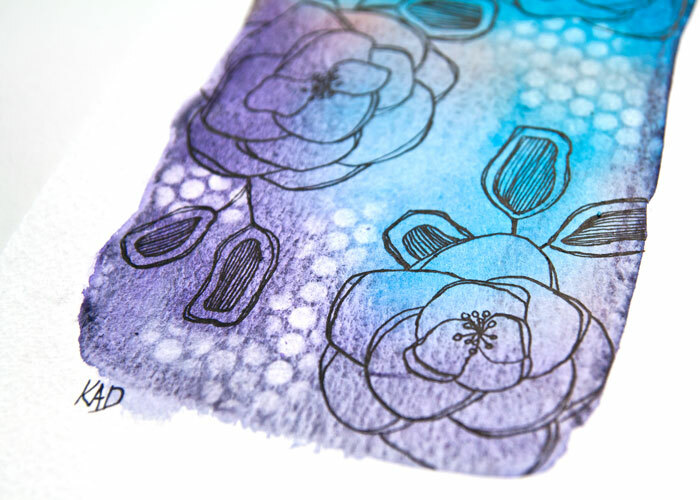 This is the watermark resist using an embossing or watermark ink. You have probably seen the technique being done incoordination with other inks and watercolours right? Well I’m using an acrylics with my watermark resist today and showing you how you can get the look too. This is a fun, magical technique which works well for art journaling, mixed media projects, card making alike so I hope that you have fun with it. I’m going to do mine as a basis of a floral illustration so watch that develop too in my video! The close up of the project and supplies are all below the video. I hope that you enjoyed that! 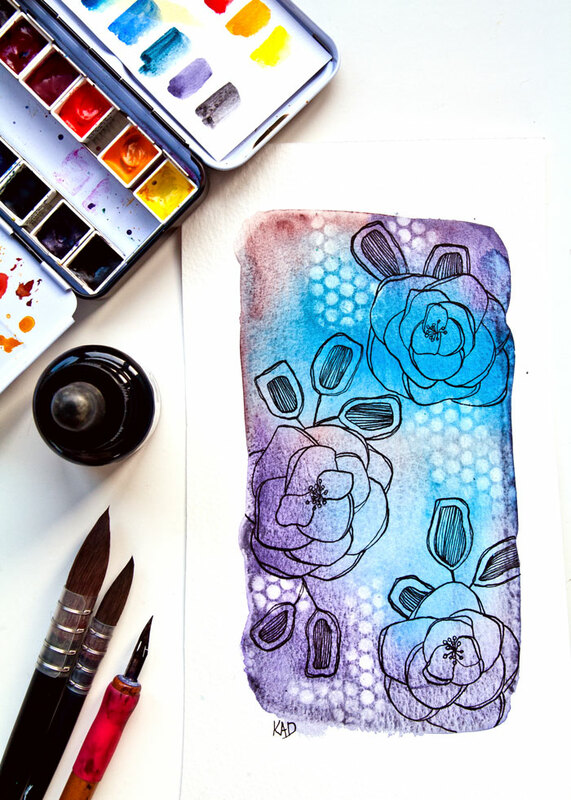 Now I have plenty more videos for you on my channel so why not try my ideas for using stencils playlist, or if you want some more resists then try my resist playlist too! Did you enjoy Inktober? Perhaps you joined in over on instagram or just enjoyed watching the art that was being produced by your favourite artist day after day through October? As many of you know I joined in too, in my small way, with this worldwide challenge started by Jake Parker and shared a daily ink sketch over on instagram. I wasn’t sure if I was going to manage to keep going the whole month because, well it is hard isn’t it? So it was a surprise to me to get to the end of October without missing a day and well, yes it wasn’t like I was sharing some of the more complex inking that many of the amazing artist do but I was still pleased with what I accomplished. 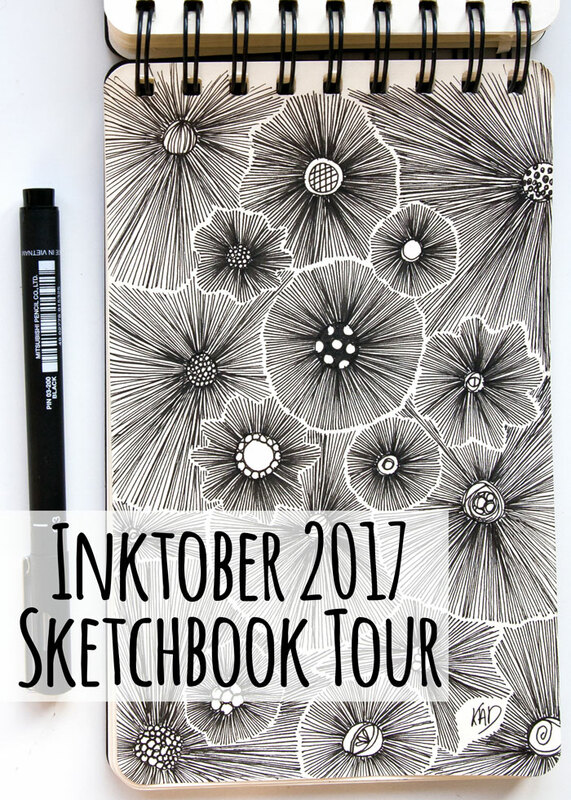 So today, as requested by you guys, I have a tour video of my Inktober 2017 sketchbook with all the good days and bad days and the scribbles in between! Scroll down for everything I used over the month and for my Inktober 2017 learning points too! Some of my learning points from Inktober? Well I definitely see some styles in my work coming through that I return to again and again. Keeping going and posting is better than aiming for perfection, but this is a hard balance as you still have to remember that it represents you and maybe the only thing people see of your work before deciding if they want to see more or move on. What I think will be popular on Instagram is totally different to what actually is popular on Instagram ? If you have any learning points from Inktober, as a participant or a watcher, then please do share in the comments below! For the drawing exercise I talk about in the video read my Sketching Exercise blog post. And if you want to have a look back over the mixed media face drawing weekly work sharing area then visit – Show Your Face. 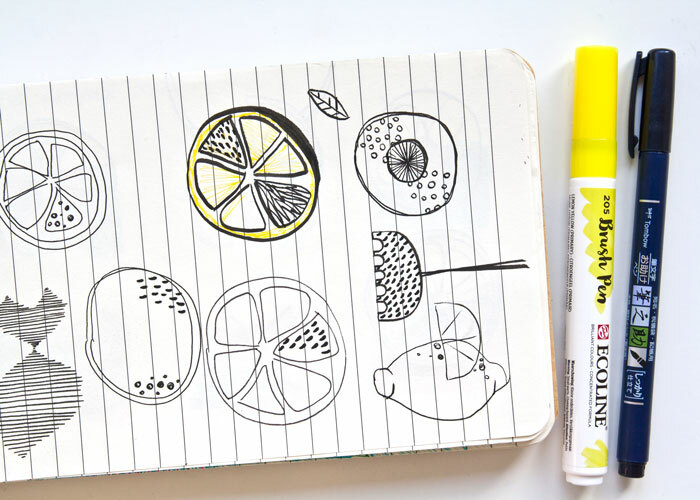 Have a super creative Sunday. Sunday is a great day to do something creative if you have the time, so I thought, as it is Sunday I would share a video with you showing the process I went through drawing these meadow flowers. I’m hoping that it will set you up for your creative day and get you itching to work on your next project. 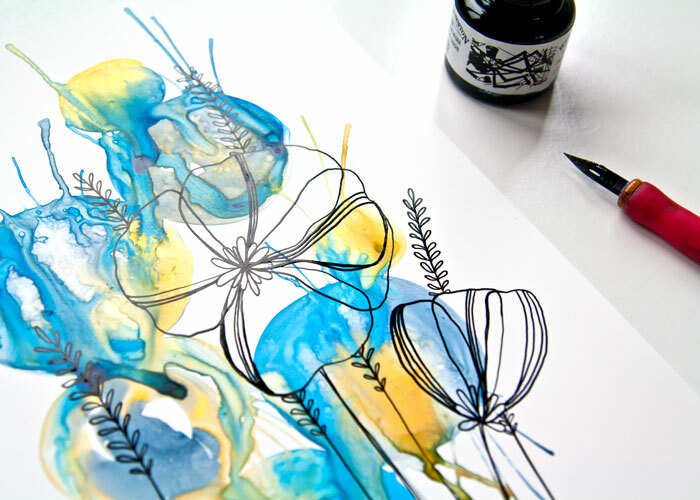 I’m working with a dip pen, or nib holder, and Indian ink again for this project just like I did for my watercolor and ink flowers video last weekend. But, this time instead of working on watercolor paper I am using the synthetic paper Yupo. I’ve already started this project with watercolor paint. 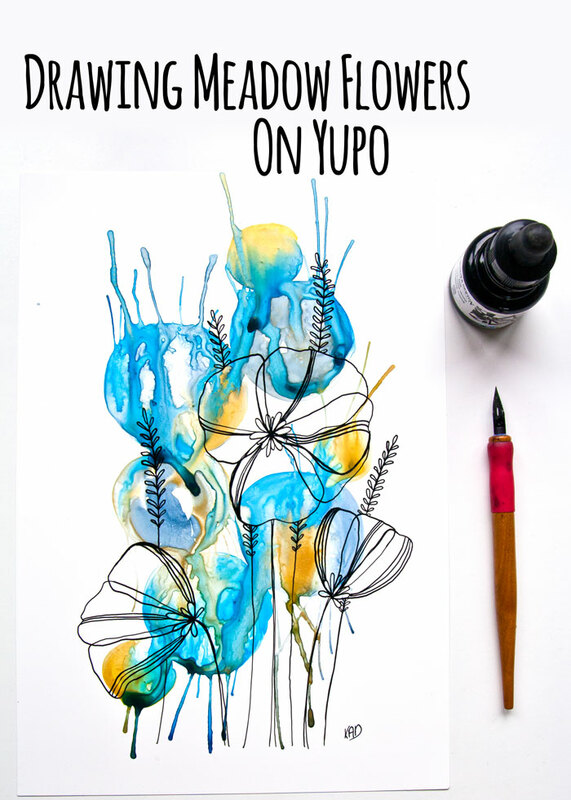 And if you missed how to make a textured watercolor background like this then you might want to watch my ‘How To Use Watercolor and Indian Ink On Yupo’ video as well. As you will hear in the video, I had not initially planned these flowers to be stylised, it is strange how our creative plans change and evolve throughout a project isn’t it? Do you think you will get some drawing done today? Or perhaps you have another creative project you want to do? Whatever you are doing I hope that you have fun and have a lovely Sunday! Happy creating.